We offer our patrons a top-of-the-line range of Power Press Machines that is fabricated under the supervision of our expert engineers. These machines are widely demanded in a number of industries owing to the premium quality of our products. Our machines are available at cost-effective rates and are strictly checked on varied parameters before the final dispatch. 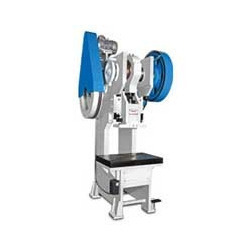 Used for the purpose of shaping various products by applying pressure, the offered Power Press Machines have a high preference in the market. Manufacturing of these products is done as per the set industry norms and guidelines and their quality never deteriorates. Further, their superior functionality and functional life is owing to the modern machines and quality raw materials used in their making. Looking for “Power Press Machines”?